⌚ Classic Bauhaus design automatic mechanical watch for men. 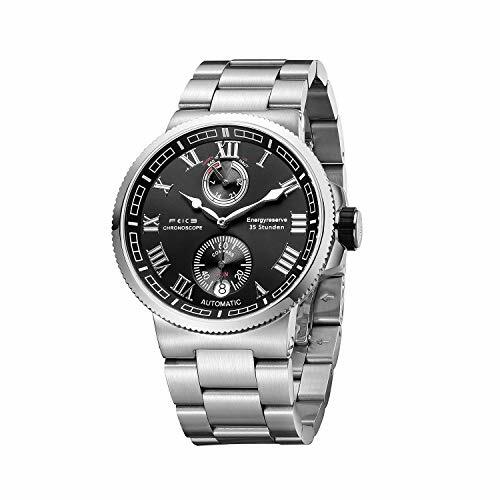 Vintage marine style sports watch, combined youthful with mature, shows your masculine charm. Big face dial design, suitable for every wrist.s the watch’s movement clearly and completely. ⌚ Multi-function dial. Two small sub–dials display, one shows energy reserve, another shows second hand, date calendar window at 6 o’clock. Luminous pointers and markers are designed for the dark night. ⌚ Sapphire synthetic mirror, increased to 2cm, enhanced waterproof perform. Sapphire crystal has very high light transmission, scratch resistance and refraction. Premium quality solid stainless steel watch band and case, make the watch more durable, prolong its a lifetime. ⌚ Water resistant to 5ATM(50M). Perfect for a beach holiday, you can rest assured of playing water games, and enjoy the underwater time. Wearable around sinks, bathing, swimming, athletic sports in shallow water, but not while snorkeling or scuba diving. ⌚ Doesn’t need a battery, wrist shaking provides energy, as you wear it, it will automatically continue to wind more. Or you can manually wind up the crown to keep it working well. All the watches in our store will enjoy 2 years warranty. Enjoy 100% money back guarantee within 30 days. For any questions, please feel free to contact us.